It was an off week for my draft squad as I scored just 30 points on the week and maintained my position in the league rankings, holding the number two spot. However, I dropped 35 points and now sit 67 points behind the top spot with many games still to play. I feel confident I can chip away at that lead. The only active transfer I made this week was the introduction of Maya Yoshida for Aaron Cresswell. It was my belief So’ton had a better match up away to Brighton, while West Ham visited Crystal Palace. It was the wrong decision, as Yoshida didn’t feature and Wesley Hoedt started. Cresswell picked up his third assist on the season. The injury to Philippe Coutinho had me shift my formation to a 5-4-1, as I opted to go with Sergio Aguero as the lone forward, forcing Tammy Abraham to the bench. Outside of Caesar Azpilcueta and David Luiz, who combined for 14 points, the defense was lackluster on the day. Ederson and Stones combined for just 2 points, while Toby Alderweireld didn’t return, giving up 1 goal to United in Spurs 1-0 loss. Looking ahead, Yoshida might not be the strongest plan, as there could be rotation in place. It was Wilfried Zaha leading the midfield group with 7 points, following his second goal in the last 3 games against West Ham. Following the Spurs game next week, Palace go on a nice run of green fixtures. Dele Alli, Richarlison and Eric Maxim Chuopo-Moting all disappointed, with a combined 5 points. Richarlison wasted futher chances, but continues to lead the way with 35 shots from the midfield. My squad has struggled without Coutinho in the starting XI and there is no guarantee he will feature in GW11. Up front, I was burnt by Pep, as Aguero didn’t see any time against West Brom, as Jesus got 81 minutes. No longer are we assured that Aguero will feature in every City game, as Pep continue to be unpredictable in his lineup selection. Looking ahead, Yoshida will be moved this week, hopefully picking up a new defender from the waiver wire, Friday. I’ve put three claims in; Charlie Daniels, Harry Maguire and Aaron Cresswell. Daniels appears to have the strongest run of fixtures, but Maguire (or Simpson) could be a surprised transfer. With the upcoming fixtures favorable for Spurs, I am on the fence with Toby Alderweireld. He hasn’t really impressed but after Arsenal in GW12, Spurs have a run of good fixtures; CRY/ars/WBA/lei/wat/STO/BHA. Not sure what direction I will take for GW11, as options abound. I could stay with a 5-man defense, running out a 5-3-2 with Aguero and Abraham up front, moving Chuopo-Moting to the bench in favor of a fit, Coutinho. I like the look of my midfield right now. Depending on what Stoke City does, I could move Moting in favor of RLC, as Palace look at strong fixtures through GW19, after the GW11 match up away to Spurs. 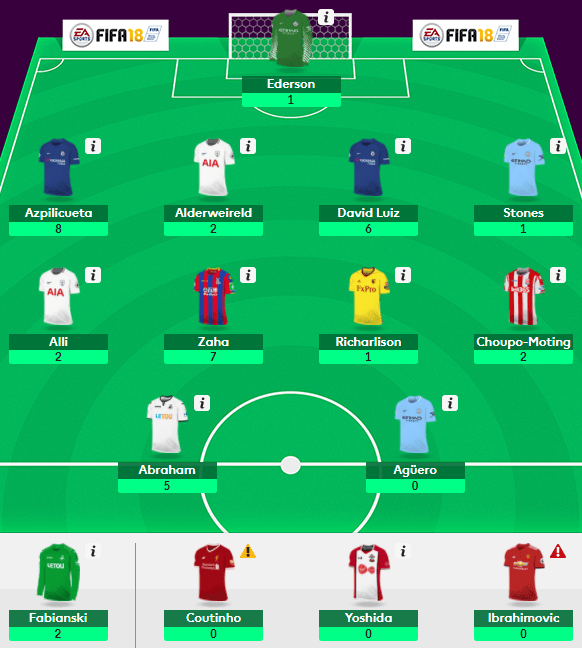 Previous PostPrevious FPL: 4-5-1 Viability? Next PostNext Premier League: Hit Me!